Rarely a week goes by at Wareable where a patent from some big tech company doesn't get us guessing about the future. Like Hansel and Gretel with smartwatches, we follow the proverbial tech crumbs all the way to the end, but we're quick to forget how many of the ideas actually make the cut - and which get lost along the way. So we're going to a mini-series we're calling 'The patented history and future of…', looking at some of the big launches in wearable tech, starting with the Apple Watch. These are going to be miniature timelines, small trips down memory lane looking at the patents that led up to the announcement and those that have happened since, to see what came true, what didn't, and what might still be to come. For a moment, let's forget 2016 ever happened and rewind the clock. Apple Watch rumours didn't really gain momentum until late 2012, but a patent filed all the way back in 2009 - which went largely unnoticed - showed some interest from the company in wearable tech, particularly in monitoring activity. Apple envisioned multiple sensors that could be attached to the body and monitor heart rate, blood pressure, stress and other things, as well as external factors like temperature and air conditions. All the information could be captured in the software - think Apple Health - and we reckon some of this will still be realised in the future. February 2013 - Whatever became of the 'iWatch'? The patent outlines a wearable that functions like a type of snap bracelet - you know, like those ones we all had as kids. Of course this is far from what the Apple Watch would become, but we guarantee Apple is thinking about it: in the last few months we've seen other patents that describe straps not too dissimilar. Also, let's not forget those rumours of an Apple fitness tracker that may still materialise - this could even play into that. Bloomberg claims Apple might introduce the wearable by the end of 2013, claiming the company has a 100-strong team working on the device. It was not to appear so soon, but the New York Times also reports Apple is working on a wearable. 'Why Apple is working on an iWatch and not iGlasses', writes Nick Bilton in a blog. The most interesting part of this application is 'Kinetic energy gathering component' which would use your arm movements to power the watch. Obviously Apple knew even then that battery life was going to be a problem, and even the new Series 2 still only manages to eek out a couple of days at most. 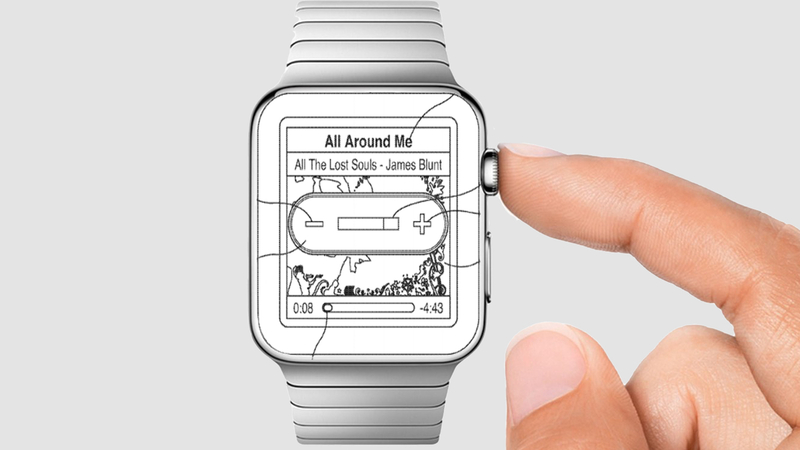 So this idea might still speak to the future of the Apple Watch. Interestingly, the patent also mentions a virtual keyboard that would work across the display. Full keyboard on smartwatches are nigh on impossible to work, but across an entire wristband it would obviously easier. Even at this point in 2013 it seems certain that in some dark room at Apple HQ, a wearable is being worked on. There are probably a few snap bracelets still lying around Jony Ive's mystery lab in Cupertino. Apple Insider digs up a patent for a input mechanism where the user can interact with a touch display without waking it. It'll recognise gestures without displaying anything, thus saving battery. Tim Cook stokes the fire at the D11 conference in May, saying "the wrist is interesting"
The patent suggests Apple had the Nano in mind here, but it also appears the Nano was setting the mould for Apple's first wearable, even if we didn't realise it at the time. In fact, an update in 2011 brought a bunch of new clock faces to the mini music player, proving Apple was taking serious the idea of people using it as a timepiece - and that, as it turns out, it was foreshadowing the Apple Watch. Don't believe us? Take a look at the bottom left face. It may not directly link to Apple's secret smartwatch, but another Jony Ive-attributed patent surfacing that year adds proof to the idea that the company had wearable ambitions. It details an armband for holding an electronic device, and though it doesn't specify what, we presume this is meant for the iPod Nano. Choice quote: "Though electronic devices are becoming smaller, carrying these electronic devices may still present a problem…. carrying and using a portable music player while exercising can be a challenge." Apple wants to find a more elegant way for us to exercise with a device. Of course if you're really delving into the details, you'll notice traces of the strap design surfaced again this year in the Nike+ Edition. Apple is well into a health hiring spree, bringing on board sleep expert Roy J.E.M Raymann, TAG Heuer's sales director, and experts from biotech companies. There were some impressive renders floating around in the run-up to the launch of the Apple Watch, with most conceptualising the device as either a Nike FuelBand-style bracelet or a watch with a circular face. When Apple finally revealed the Watch in 2014 the square face was a surprise to many. It shouldn't have been: the first big hint was dropped in April 2014. Apple obscured the details in the patent by saying the referenced device could be many things, but it did list a "wrist-watch device" as one of them. There was also a picture of a square display, as dug up by Patently Apple and shown above. Down to the slight curve of the display, it's not a million miles off what we got with the Apple Watch. The built-in camera, however, is something that still hasn't materialised, despite persisting rumours that Apple will eventually add it. Another thing: the antenna. Apple hasn't yet followed its rivals in adding cellular connectivity to its smartwatch, finding other ways to make it more functional without an iPhone. Before the arrival of Series 2, the Wall Street Journal reported that Apple was going to change this in the new watch, but Bloomberg followed up with a report claiming Cupertino was having trouble with untethering. We reckon it will come soon, but it's interesting to see Apple was thinking about it as early as 2014. Things start heating up. A new patent, filed for back in 2011, finally surfaces and throws tech sites chasing iWatch SEO into panic. It's actually called iTime, says the latest patent, which has the name written across the device's display. However, what is described is a strap that would hold a small device, which looks rather Nano-esque in the images. There's even a 3.5mm headphone jack on the side, which doesn't make much sense on a smartwatch if you ask us, but there you go. The patent makes mention of GPS, accelerometers and even haptic feedback. In fact a lot of what's mentioned here ends up in the Apple Watch except that, again, it seems to be using the iPod Nano, which is explicitly referenced in the writing. There's also a lot of mention of gesture control, only some of which came to fruition with the Apple Watch. We think there may be more to come, which we'll touch on shortly. Reception is mixed. But there's that square face, and a digital crown - which we hadn't seen yet. Despite the patents there's no wraparound display, cellular connectivity or front-facing camera, but the design isn't too far off. Oh yeah, and you were all wrong about the name. All of you. It won't launch until the following year. We're back on the straps again. In September we spot a patent for a type of watch strap that could double as a display. It reminds us of the early snap-band LCD, and shows Apple continues to see room for innovation around the rest of the wrist. Talk of a cheaper fitness device starts brewing - could this incorporate any of the ideas we've seen so far? We mentioned that the iTime patent described some gestures that never came to fruition, but a more recent patent, filed for in 2013 and published this year, shows an idea that would use the wristband that includes sensors to detect gestures that could control the music, answer calls, open certain apps and so on. June 2016 - A camera cometh? Yes ok, we're screwing up the timeline by going back a few months here, but stay with us. In June another Apple Watch patent appears that does make reference to a camera. Now, it's possible this is referring to the remote capture feature that works with the iPhone, but we think it's possible Apple is considering, again, how a camera might work in the Watch. FaceTime is a headline feature across Apple's devices, and it makes perfect sense that Cook and co are thinking of how it might also work with the Watch. Oddly, the patent also shows two new buttons along the left side of the watch, which we've no explanation for. Apple is more likely to remove buttons - and just about anything else it can, apparently - on its devices than add them, so it seems a tad odd. But then the rest of the design isn't an exact mirror of the device, so who knows? All we know is that, as with all patents, there's no use in betting on specifics. Some of the ideas do come around, others take longer, and some never appear at all. Start speculating on what the Apple Watch Series 3 will bring - just don't bet your mortgage on it. As for us, going by what we've seen so far, we think a camera and cellular connectivity look likely for the Series 3, while we expect Apple to continue doubling down on health and fitness. Time will tell.